I don't know about other people, but I am usually not awake until my first cup of jo and breakfast. As unpleasant as waking up early is, it is rather important if keeping our day job and sending kids to school on time are priorities. Regardless, I have discovered starting the day off right with good solid breakfast will make all the difference in the world, at least the balance of the morning before lunch. Although toast and cereal can be easy and fast, but these can only go so far. The tedium of eating the same thing everyday can start to literally eat away at me (no pun intended). I need choices. In order to keep myself eating breakfast, I treat myself to breakfast with varieties like ready-made Belgian waffles, microwavable pancake, breakfast sandwiches or a loaf of yummy brioche? Often time, I will add smoked salmon, and varieties of breakfast meat to make breakfast more luxurious and substantial. On relaxing weekend, I love to invite friends over to a brunch of smoke salmon with bagel, waffle with homemade jam, and bacon, all with assortments of fruits. Of course, what is morning without that cup of jo? There are mornings which I wished I could just inject caffeine directly into my vein. Although I don't mind spending money buying coffee in the morning if I am truly in a hurry, I rather take my own coffee to go. This way, I can enjoy the aroma in the morning as I get ready and save money. Last but not least, I love my kitchen pretty in the morning. It is very weird but having a clean bright kitchen makes me feel better. Some studies suggest that chirpy, bright colours can brighten mood and enliven character – so the simple purchase of funky,colorful Morphy Richards toasters – or a fresh coat of paint on the kitchen wall – could actually make the difference between a good start to the day and a bad one. How do you start your morning right?? I don't really eat breakfast at home. But I love going out for breakfast. I am meeting up with friends this morning! yummy! i seriously need to be better at this. Oh wow this looks (and sounds) heavenly. I need to be better about eating breakfast. I normally just have a glass of milk or tea. But then around 4 p.m. I find myself being so exhausted. I bet it has to do with my lazy eating schedule. I need to sort of protein in the morning, otherwise I'm hungry an hour later. I usually opt for an egg, but salmon is a great idea! Breakfast is my favorite meal, but it's the one I rarely get to eat. Coffee is a must and it's usually a PBJ during the wek. 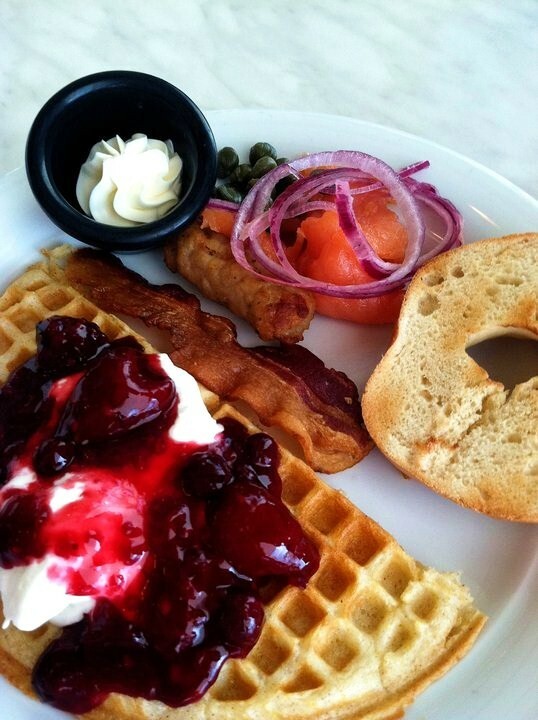 I love to indulge in breakfast buffets once in a while...waffles and pancakes and ham are my faves! I have to start my morning with breakfast! :) I can't get through my day if I don't. Usually it is yogurt with a granola bar because I usually wake up just in time to get to class.